The Christ in Prophecy Journal: Why a Defending the Faith Conference? What is really sickening to me are the attacks from within Christianity. I'm not surprised by them because the Bible prophesies over and over that a great apostasy will occur in the Church in the end times (2 Thessalonians 2:3). But still, I find them disheartening. Eric Barger, one of Christendom's leading defenders of the faith, told me recently about a worship service in the Seattle area that featured Brian McLaren, the leader of the apostate Emergent Church Movement. McLaren challenged the Church's traditional interpretation of John 3:16 as applying to personal salvation. Instead, he applied it to the earth, arguing that when it says, "God so loved the world," that it was talking about the cosmos and the environment! His altar call consisted of inviting people to come forward and stick their hands in barrels of dirt and make a commitment to save the planet. This lady(Jill) can't believe her reading eyes and has just danced around her kitchen in excitement. I am from the Seattle area...don't know much about the emergent church but do know things have gotten mixed up in general. It is time to remember and preach the pure Gospel seed...not that we, the church, should have ever made hybrid Gospel seeds but it happened. Sow the pure Gospel seed...in may fall on all types of soil...but sow, sow, sow. Now this is getting fun. 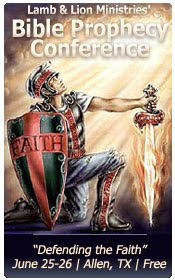 The Prophecy Conference poster is so small, - are those motorcycle boots authentic Harley boots? hartdawg...is that a word-play on the Husky Dawgs! Go Dawgs! Maybe this will be the year for them. Yes, I have heard of Mars Hill Church, but not as much as one would think considering how fast it has grown. I was already locked in to a local church before this church bloomed. I like the church I attend...the pastor has walked with the Lord Jesus for 50 years. Anyway, for security reasons, I can't say where I live, so I will just say that I drive by one of the main campuses most days...not yours. I just checked out the Mars Hill website...some tips on good reads. I like Spurgeon too...but really, who doesn't? Thank you. That is a great name...Mars Hill. I like it. I have been watching Paul, so to speak, and trying to digest excactly how he was able to open the door to converstion in this very Scripture...Acts 17:19-34. It is brilliant. He did not say..."You pagans, you have it all wrong, you are going to burn, throw out your idols, God says you shall not make for yourself an idol, etc..." and then walk away in disgust.